Every town should have one: a place where a visitor can stop in and see what the place is all about; an informal rest stop where you can sit, relax, and enjoy friendly conversation about local curiosities, things to do, maybe even the weather. Jeanette and Tony Iuratto thought Blairstown could use such a place when they moved to the Warren County town a few years back. “There was no one place where we cold go to learn about the town, what we were inheriting as residents, or how we could become good stewards of our new home,” remembers Jeanette, who opened the Blairstown Museum in 2016. “At first, we pitched the idea to the Township officials, who had neither the funding nor volunteers. 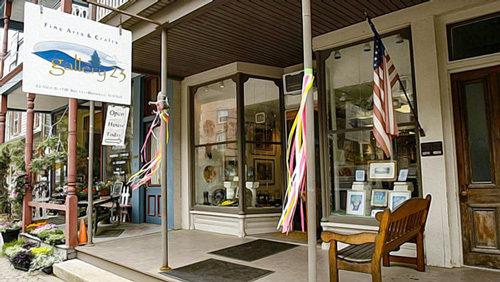 But most supported the idea if we did it ourselves!” After they reached out to some of Blairstown’s multi-generational families and found that they too would support the idea, Jeannette and Tony went ahead and purchased the building at 26 Main Street, one that had been empty for seven years. 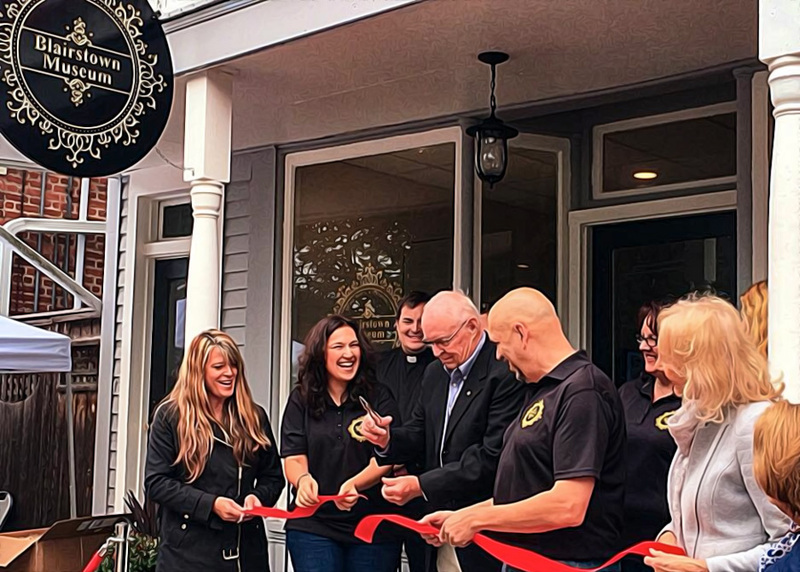 It took them eighteen months to renovate the dilapidated interior and polish the structure’s exterior, which features one of Blairstown Historic District’s many distinctive two-story porches, particularly reminiscent of late 19th and early 20th century main streets. In 1839, Blairstown was named in honor of its most celebrated citizen, John Insley Blair, who, despite his nineteenth century accomplishment as one of the world's wealthiest men, sustained a simple, unembellished lifestyle in his beloved village. 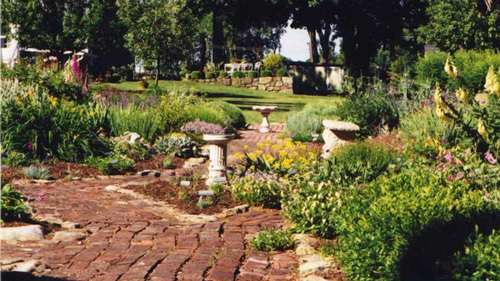 The area's extraordinary heritage is in large part due to the fact that his ambition, and his ideas that flourished throughout America originated here in the New Jersey frontier. Almost half of the primary buildings within the District were built during John Blair's lifetime, the boom period following the construction of the Blairstown Railroad. The distinctive historical character of the village results from the survival of these buildings, largely because the railroad was the last major transportation improvement that the town has seen. State Route 94 has since bypassed Main Street as the main thoroughfare for travellers, and buildings "in town" have suffered few contemporary updates. Most serve as storefronts, restaurants, galleries or offices; and one as a museum. 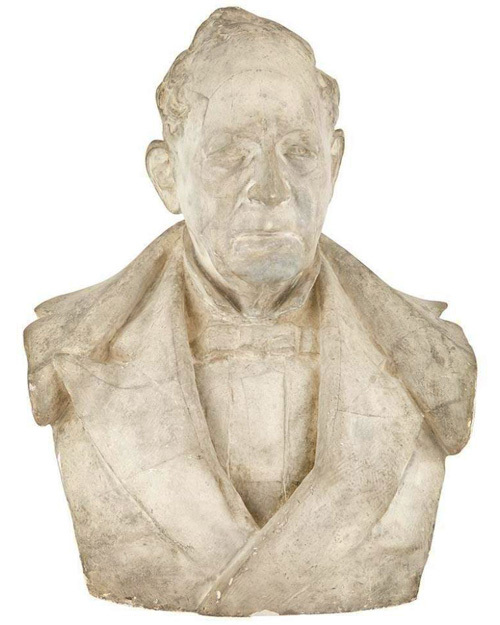 John I. Blair’s visage greets visitors to the Blairstown Museum in the form of an impressive 1883 sculpture by Olin Levi Warner that once sat in the Metropolitan Museum of Art. One of approximately 4,000 items in their private collection, the Iuratto’s acquired the piece at auction from the Blair family estate. 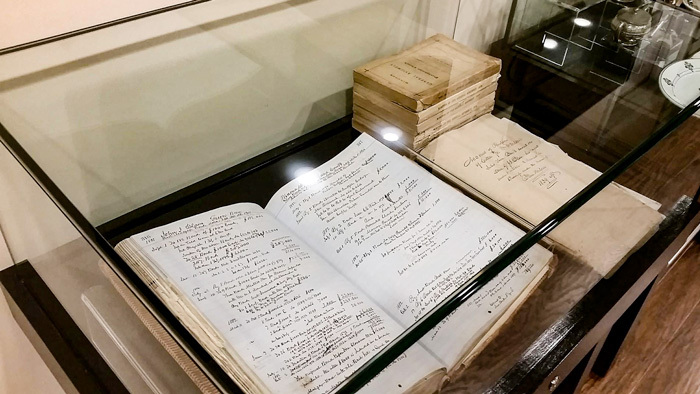 Probably half of the museum’s rotating displays center around Blair’s acquisitions, deeds and other assorted papers that document his robust business activities. The entire collection, most of which is not contained in the archives at Blair Academy, will eventually be scanned and publically available as a digital library. 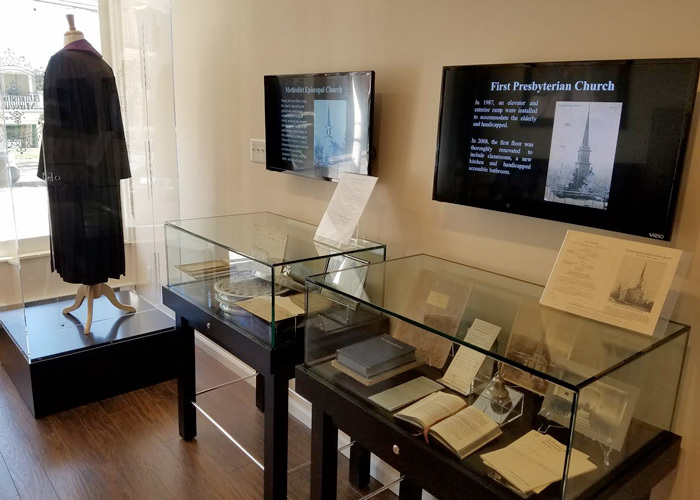 Other exhibits at the Museum have documented life as Blairstown knows it: dining and hospitality, houses of worship, and local legends; all constructed from artifacts and collections from long established families and business in town. And, of course, the ever popular cult of Friday the Thirteenth, the 1980 horror film that, for millions of movie viewers, made Jason Voorhees Blairstown's most famous resident. John Blair documents on display. The non-profit museum also contains a small gift shop that offers many items made by local artisans. Along with donations, sales from the shop supply funds to keep the museum open. About twenty volunteers assist the Iurrato’s in the museum’s operation and upkeep. 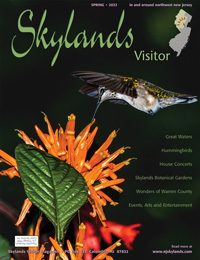 Recent exhibits at the museum. The Museum has naturally assumed its place as a center for community activity, and Jeannette as Blairstown’s most fervent ambassador. In June, a twenty-four seat trolley will begin picking up passengers at the museum to take them on excursions to local farms, wineries and other points of interest. Jeannette and Tony found it on EBay motors, brought it home, put in a new engine and air-conditioning, cleaning it up for local consumption. They figured every town should have one. The Blairstown Museum is open Friday, Saturday and Sunday. 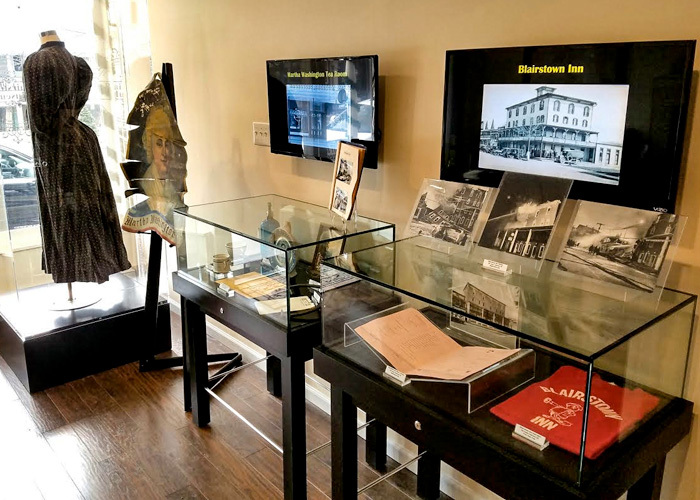 View original artifacts, postcards, and correspondence that illustrate the history of the township and its inhabitants, including former resident and namesake John Insley Blair. Museum collections are on display on a rotating basis throughout the year, and lovely gift shop items are supplied and crafted by local companies and artists.